Breaking Bad hasn't even begun to wrap up with its final 16 episodes, but already Vince Gilligan is getting your hopes up about reviving it with a continuation of sorts. "I would love to see a Saul Goodman spin-off show when it’s all said and done," Gilligan tells Entertainment Weekly. "While Breaking Bad is by design a show that is finite and limited in its scope—it’s a story of transformation that cannot go on forever—I think a Saul Goodman show could have great legs. I love the idea of a lawyer who will do anything to avoid going to court. He’s always going to settle on the courthouse steps." 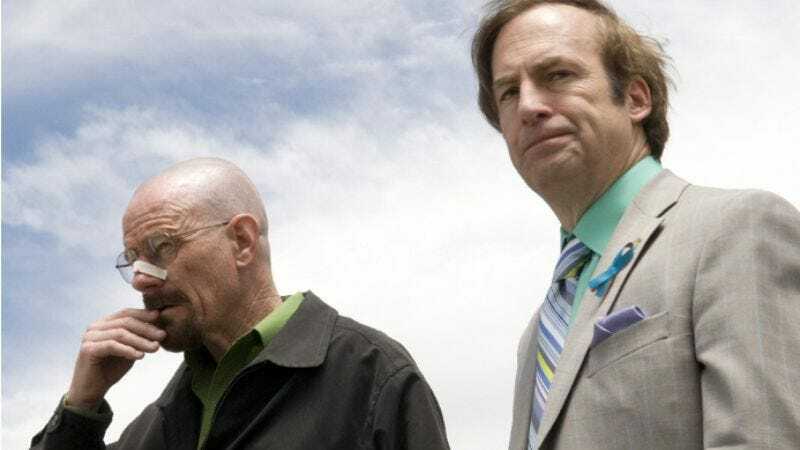 Still, no one should start pestering Gilligan or Bob Odenkirk about when they're going to make Better Call Saul: Albuquerque Nights, or whatever, at least not until they see how the rest of Breaking Bad unfolds. Gilligan cautions that just because he's talking about the possibility, "No viewer should breathe a sigh of relief that Saul won't expire by the end of Breaking Bad." Of course, Odenkirk also suggested that even if he does, the show could be "done as a prequel," so really, there's no end to the ways that you can already begin clinging to the idea that the series might return someday in some capacity, even while it's still on the air. Hey, why not Breakfast With Walter Jr.? That could also be a thing.